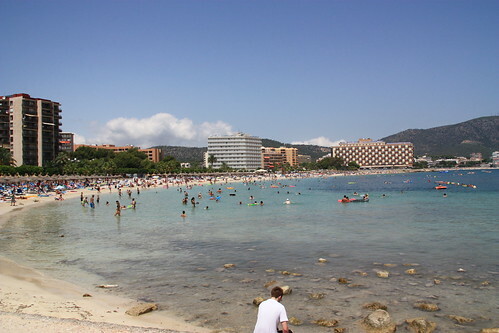 Palma Nova is one of Mallorca’s biggest mass tourist resorts, it has now merged into the neighbouring resort of Magaluf. The Balearic island of Mallorca has some great tourist resorts and Palma Nova is one of the busiest of these beach resorts. The even bigger neighbouring resort of Magaluf is a better place to look for work but there are still good summer job opportunities here in the various bars, pubs, restaurants, hotels and clubs. Palma Nova is quieter than Magaluf but still a busy, built-up resort. It was created in the 1960’s so it does lack charm and character but it has three good beaches: Playa des Carregador is the quieter of the three beaches at the northern end, Playa de Palma Nova is in the middle and Son Maties at the southern end next to Magaluf. Head north to some lovely secluded coves, including Son Caliu. Perhaps you might find work at the beaches helping with teaching windsurfing, pedal boat hire, banana and doughnut rides? The three beaches are lined with hotels, fast food restaurants, cafes and bars so there are plenty of vacancies in summer. For other towns and resorts see our main page on jobs in Mallorca. This main page also shares some of the best sources for finding jobs in Mallorca and Palma Nova such as job websites, forums, job centres, newspapers, classified job advertisements, recruitment agencies and employment agencies. Nothing however beats word-of-mouth, as most job vacancies in Palm Nova will not be advertised. Bar, restaurant and club owners tend to give work to those who come in asking for work on the spot. Most jobs will be paid cash at hourly rates usually of around €5 per hour. These seasonal or summer jobs will be from May to September so are ideal if you are a student on holiday from university. If you are looking for work in Spain then consider the neighbouring Balearic island for Ibiza jobs or the Canary island of Tenerife. Where is Palma Nova, Mallorca, Spain? Palma Nova is located in the municipal district of Calvia on the western side of Mallorca (Majorca). Getting to Palma Nova is easy enough with just a transfer time of twenty minutes from the Son Sant Joan International airport close to the island’s capital – we have a page about working in the capital – jobs in Palma de Mallorca. 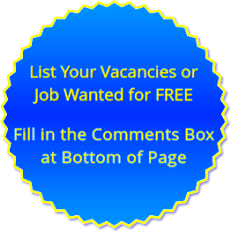 * Free job listings for Palma Nova for employers below. * Want a job in Palma Nova? – fill in the comments box below and leave your details and jobs wanted. Looking for work in Palma nova or Magaluf. Can start immediately as I’m currently on the island. Experienced in Bar Work / Bar Management also PR Work. Hello my name mark looking for bar work may until late September magaluf or palmer nova 2019. Can also be fitness instructor. Part time or full time thanks. Hi. I’m looking getting a job a in palma nova for 2019 season. I currently live in the UK. But my boyfriend has got a contract for entertainment staff. I’m looking at full time work mostly housekeeping/receptionist or waitress in a little cafe. I am Bibhuti Sapkota from Nepal and currently i am residing in Santa Ponsa. I am looking for a job in restaurant / hotel industry. I have a Bachelor Degree in Hotel Management. I have a good command in English and Japanese and some basic Spanish. I am from Ghana and now studying in Italy. I’m looking for the opportunity to work in Mallorca in this summer.I’m capable of teaching English and also willing to work at the restaurants and hotels. I speak English and ready to learn other languages as well. So kindly mail me with any available job. gboakye181@gmail.com. My name is Rowan and I am a painter. I have a web page to show my paintings to sell for example to hotels. When you are interested, please contact me. I also want to work for your Hotel directly, as a painter / decorator? I do have examples of my work from kids clubs, done on Mallorca and Fuerteventura. I am able to Paint your kids club as well? I want to work for your hotel. Any work, cleaning or other. I speak English, Dutch, German and Spanish. Also I have lots of experience as Animator, as DJ and decorator. And activities for children. Send me a message if u do have a place available. Thank you so much. Hello, My name is Gloria Presley, Im looking for one oportunity to work as Security Officer, I have my SIA Licence, I have 5 years of experience in one of the larges companies BBC television, I heve very good Customer Service, and speak Spanish, that is way I would like to work in Spain. But I would accept any other type of work, and available for everything. Hello, I am looking for any kitchen work if possible but would accept any other work available. I am hard working and have a good sense of humor. I would be traveling in the next couple of months but could hold off a little longer if work was available a little later on. hi, looking for bar in Palmanova or Magaluf, have previous retail and bar experience and am coming over on June 4th to look for work. I would like to get some bar work but restaurant work would also suit thanks. i live in palmanova and would consider any type of work.i have good people skills,like to help and am able to solve most problems efficiently.most importantly i want to work and have hotel,restaurant and shop experience but will try anything new.thanks for your time.